Israel is willing to share their innovations to help Ukraine solve the problems concerning the sphere of civil protection and ecology. This was stated by the participants of the Israeli delegation during a meeting with representatives of Russian IT companies. 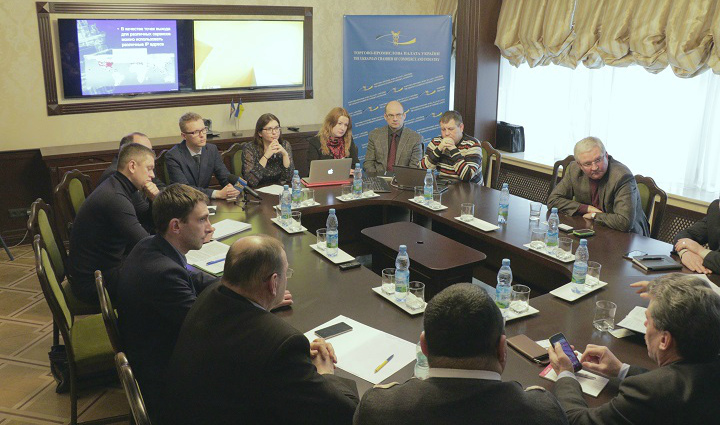 The meeting was held in the framework of the meeting of the Committee for electronic communications at the chamber of Commerce of Ukraine on February 14. The event was attended by commercial attaché of the Israeli Embassy in Ukraine Elizabeth Solovyova, Chairman of the Committee for electronic communications at the chamber of Commerce of Ukraine Volodymyr Kolyadenko, first Deputy Chairman of the State environmental service of Ukraine Igor Yakovlev, heads of departments of the State service of Ukraine for emergency situations and representatives of domestic business in the field of information technology. According to commercial attaché of the Embassy of Israel in Ukraine Elizabeth Solovyova, the Israeli business is interested in cooperation with Ukrainian companies in the field of IT. Moreover, the Israeli developments and innovative solutions can help to solve in Ukraine a number of issues related to cybersecurity, and as a result, positively influence the development of the economy and all its sectors separately. Our office treats a lot of companies from Israel, which want to establish cooperation with the Ukrainian business. Israeli entrepreneurs to participate in exhibitions held in Ukraine, and actively invited the Ukrainian business to review their development and define what solutions they need, what innovations can be applied in Ukraine. I want to emphasize that the Ukrainian IT-industry is growing rapidly and progresses. We see, therefore, understand the opportunities that are opening before us in the case of cooperation and exchange of experience in this field. I want to emphasize that our office collects information on Israeli technologies in the field of security, cyber-security, in the field of environmental monitoring, efficient use of energy resources. Therefore, those Ukrainian companies which are interested in cooperation with Israeli businesses, you can find all the necessary information through the chamber of Commerce, or contacting us directly – said Elizabeth Solovyov. She added that Israeli technology is based on more efficient use of resources in the IT industry. This allows you to reduce costs and, consequently, to obtain greater profits. According to Elizabeth Solovyova, the Israeli experience and innovation can help Ukraine to solve urgent issues related to the prevention of emergency situations and protection of population. We know how sometimes it's hard to find an effective solution, which also should be qualitatively applied at the state level. So the Israelis are ready to offer ready-made solutions, which show the results for a long time and its effectiveness. This will reduce for the Ukrainian IT industry long-term innovative research projects in the field of civil protection. In addition, Ukrainians and Israelis will be able to create joint projects and use them to enter global markets, which positively flows to the development of entrepreneurship in both countries, said Ms. Solov. It should be noted that Israel has created favorable climate for the development of the IT industry. Thus, the state for a long period of time provides tax and other incentives for innovative companies. There is a program of technological incubators, the support companies in the process of scientific and technical research. It is therefore not surprising that Israel is currently ranked first in the world in innovation, second in research work. Therefore, an important conclusion from the experience of Israel is that the state should support new developments and at the same time not tie the hands of researchers. Even 60 years ago, Israel exported mostly citrus fruit, and today 11% of Israel's GDP – high-tech products. By the way, of the 70 billion dollars of exports to Israel, more than half accounted for by high-tech goods. While the country has more than 4 thousand startup companies that call the "Israeli miracle." Another feature of the Israeli IT industry is that they are open to the world. In addition, when all Israeli universities continuing to operate the company, are engaged in the promotion of patents of faculty and staff of the institution. These patents are registered not only in Israel but in other countries where necessary. Elizabeth Solovyov said that the main role for the development of this industry in Israel is played by the Ministry of defence and the Ministry of industry and trade. There are special departments – offices of the Chief scientist. They are responsible for innovation policy, generated funds to support new developments and the like. We should stop the emphasis on support funds. In General, part of these funds is distributed for the competition, so everyone who wants to get the money on your project, apply. Further, the Fund considers each application and makes the decision to provide financial support. It should be noted that such contests are organized transparently and professionally. At the same time, there are funds where selection can take place without competition. In this case, also, each participant must submit an application, but there is one condition – the applicant for funding must be a business partner. One of the most important places in the system of innovation development of Israel took the incubators. Each of them can simultaneously develop about 10 startups. Each project can be in the incubator for 2-3 years. It is important to note if the project proves successful, the entrepreneur gets money through a royalty, typically 4% of sales. If the project does not generate revenue and is not being implemented properly – no responsibility before the state, the entrepreneur does not carry. Of course, the selection of applications is carried out very carefully and attentively, but in any case, IT-business in Israel feels effective support and capacity. In addition, the office of the Chief scientist allocates annually about 500 million dollars in scholarships for various studies and innovative developments. Sometimes it covers up to 60% of the total cost of each project. At the same time, about $ 100 million annually amount of compensation of the Ministry of industry and trade in the form of interest payments if the project was successfully implemented. Every year more than hundreds of Israeli companies signed contracts with investors from different countries. Usually the contract amount starts from a few tens of thousands to tens of millions of dollars in each of the startups. Besides the Investment center of the Ministry of trade and industry provides young and talented entrepreneurs who want to realize themselves in the field of information technology, subsidies for the creation of new enterprises. The Ministry also supports the expansion of existing companies in the field of IT-technologies. Loan size in this case may depend on the region. For example, companies that are located in peripheral areas, are eligible to apply for more substantial grants. Although the company's high-tech direction, as a rule, are not particularly capital intensive, so they choose another form of incentives – tax incentives. In Israel also operate investment funds, which are willing to invest in the creation of innovative companies. Every year at least $ 3 billion invested in Israeli and international venture capital in Israeli innovative projects with a high degree of risk that is comparable with the volume of venture capital investment. If such trends continue, soon Israel may become a new innovation center in the world. All this suggests that Israel is a very promising market for Ukrainian business. And the establishment of close linkages between domestic and Israeli IT companies could be the beginning of a new, more progressive, economic and trade relations between the two countries. During a meeting in the chamber of Commerce of Ukraine's domestic and Israeli business representatives especially insisted on this. In addition, they exchanged experiences in the use of IT technologies in the field of ecology, in particular in the protection of the environment. Therefore, it is possible that very soon to solve environmental problems in the country are using proven Israeli technologies. We have some serious problems at the national level in the field of ecology. This organization of monitoring state of natural environment and the results of all the changes that occur in the country in this field. It would therefore be very interesting to study the experience in Israel on the state level, new technologies and see how we can apply them in Ukraine, – said the first Deputy Chairman of the State environmental service of Ukraine Igor Yakovlev. Embassy of Israel jointly with the CCI of Ukraine plan to hold a series of events for entrepreneurs of both countries. Convinced that this will not only improve the cooperation in the IT sphere, but also to stimulate mutual investment in the sector. Very important for us the cooperation with the chamber of Commerce and industry of Ukraine. I believe that such a business Association, which unites under one roof a very large number of representatives of business, you can more accurately describe the needs that have business. The events, organized by the CCI of Ukraine, could be one of those platforms on which the Israeli companies can present themselves and share their experience with representatives of both small and large Ukrainian companies, – said Elizabeth Solovyov.